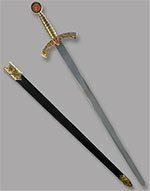 This sword is a tribute to the historic group the Knights Templar, an organization originally founded to protect Christian pilgrims in the Holy Land. This is a highly ornamental sword with a beautiful pewter colored metal hilt featuring a golden cross in the pommel and embedded golden colored coins in the grip and guard embossed with various designs of religious significance. 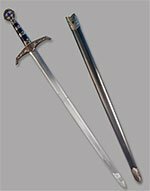 The blade of the sword is polished stainless steel with sharpened edges. The sword incudes a black metal scabbard which is trimmed on the top and bottom with decorative pewter colored fittings. 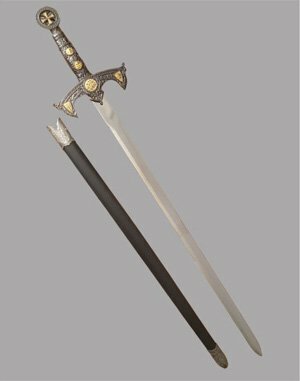 This sword is a beautiful show piece which is especially well-suited for anyone interested in the religious historical significance. Width of Blade: 1.25 in. Width of Guard: 7 in. I am a direct descendant of Hugh de Payen first Grand Master of the Templars.